Is there anything more heavenly than curling up in a sunny little spot with a good book? When fall starts to come back around I always find myself gravitating toward the bright, sun-drenched side of my couch, inevitably grabbing a novel along the way. I’ve often thought how lovely it would be to have a dedicated spot just for reading. My requirements for the ideal reading nook include lots of natural light, somewhere cozy to sit (oversized chair, pile of pillows, etc. ), a place to rest my books and snacks, and a blanket to wrap up in. Even better, that it be unplugged – no laptops, iPods, or TVs nearby. There’s something about being away from all the electronics (as much as I love them) that makes the experience ethereal for me. What about you? Where do you find yourself returning to in your home when the air starts to chill? I just love the idea of a reading nook. And I so agree about the need to keep electronics out of such an area. As the weather has started to cool, I've been working on re-decorating our master bedroom to give the whole room a cozier look. I think it will soon be a place I will want to escape to this fall and winter. The room in that top picture is amazing! I love the huge window. It looks like the perfect place to sit in a sunbeam and get wrapped up in a book. 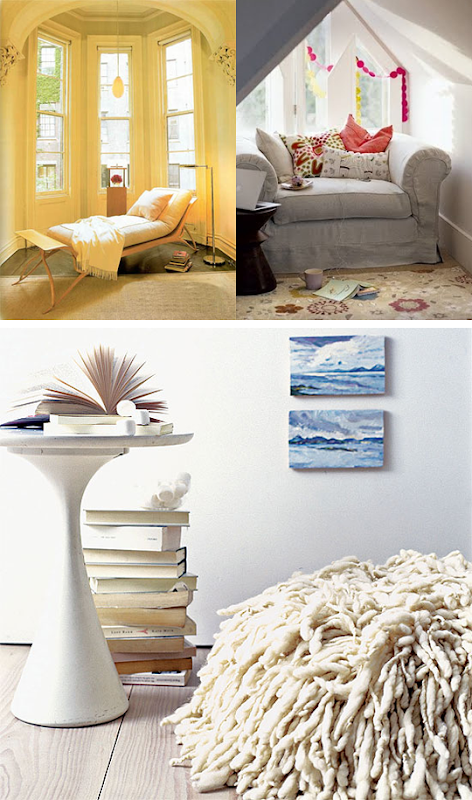 How funny, I just blogged about my own ideal reading nook just the other day. Cozy chair? Check. Sun-drenched spot? Check. Transporting and absorbing book at your elbow....with maybe a glass of wine or mug of hot coco? Check, check, check! That pillow that looks like a sheep dog! Greatest thing ever! I want to be there! Love that overstuffed chair!! Makes me want to stop what I'm doing and grab a book right now. lovelovelove the armchair & colourful pillows. 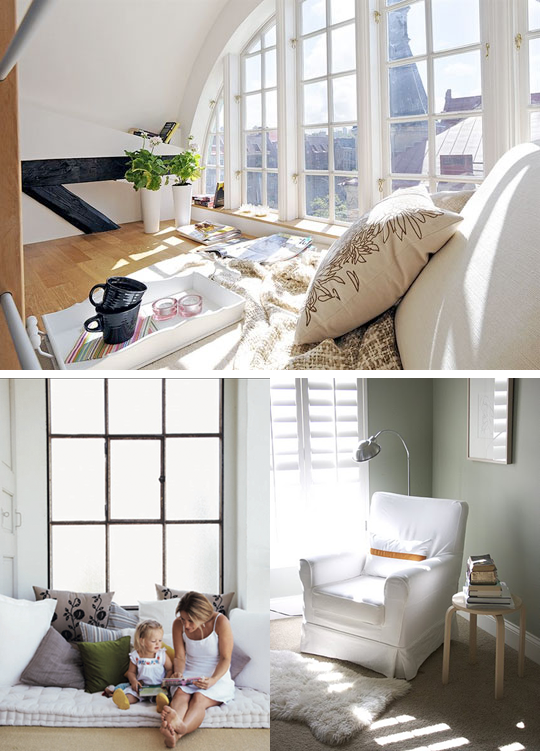 I've been known to move into a house simply because it had a bay window seat! the photo at the very tippy-top has me falling off my chair! i am dying over how stunning those windows are! and that view?! the sunlight?! the crispness of it all! that is so much more than a reading nook. it's a reverie! Yes! If I'm not outside reading I find myself sitting in the most sun-drenched nook of my couch. All of these are beautiful! Thanks for sharing. Love this idea and sure beats dragging my mini portable heater frm room to room to get cozy while reading.. Absolutely dreamy... Everyone needs a perfect place to pick up a book. I've always wanted a reading nook. The first one is precious! All those windows are amazing! I wish I had a view like some of those. That top photo is all sorts of amazing...makes me want to curl up there and never leave. So jealous of all that natural light....lucky ducks!